Fall is my favorite time of year, and living in Las Vegas it is the BEST time of the year in our fine city. Despite not having any plans for any live shows in the near future (though I am pretty sure I will be seeing Imagine Dragons & The Mowgli’s here in Vegas at the end of the year), I’ve still be listening to a lot of music and have caught a couple shows in the last month (other than Life is Beautiful). Two days before Life is Beautiful, @Begt and I (along with a few others) went to see The Naked & Famous at the BLVD Pool at the Cosmopolitan Resort here in Las Vegas. As I’ve mentioned before, this venue is pretty amazing. The show happens right above the pool, and for larger shows the main pool is drained (it was half-drained for this show). I had thought that this show would be the most well attended of the shows I’ve attended this summer/fall (including Edward Sharpe & The Magnetic Zeros, WAVVES, G. Love, etc…) however, this show was not as well attended as ESM0’s which was pretty darn packed. Apparently TNAF is not as popular as I expected. The sound at the BLVD pool can be a bit sketchy, and this show definitely highlighted that. With the electronic beats from TNAF there was some distortion. This was a bit distracting, but it was not the end of the world. I really expected the group to be a bit more talkative. As groups go, they were pretty quiet and stuck to business. They played a mix of songs from their two full length albums. The crowd favorites were definitely “Punching in a Dream” and “Youngblood”. My favorite “Girls Like You” was one of the earliest songs in the set. 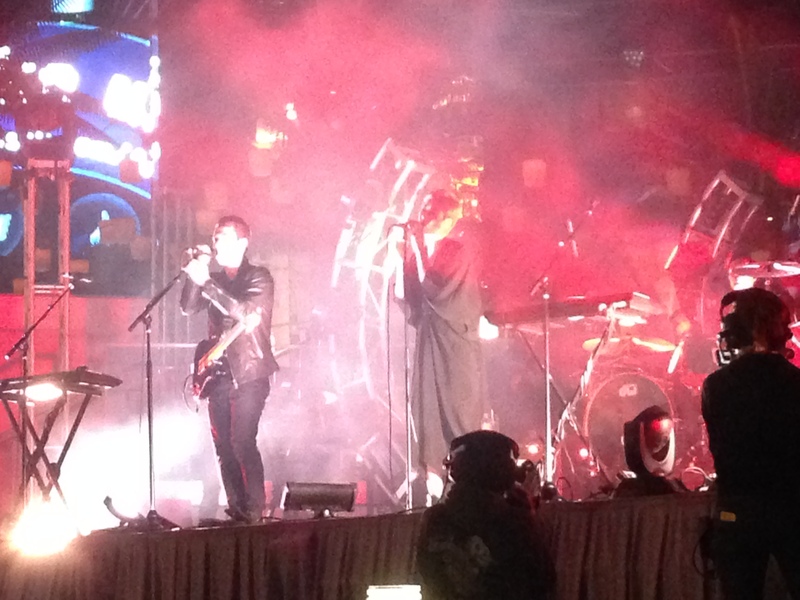 The set ran just over an hour, which is not surprising noting that TNAF’s catalog is not very expansive. I do think that they are more of an “inside” band, and North America will get to see them open for Vegas’ natives Imagine Dragons on their upcoming arena tour. I enjoyed the show, but would think they would fit better in a smaller indoor venue. 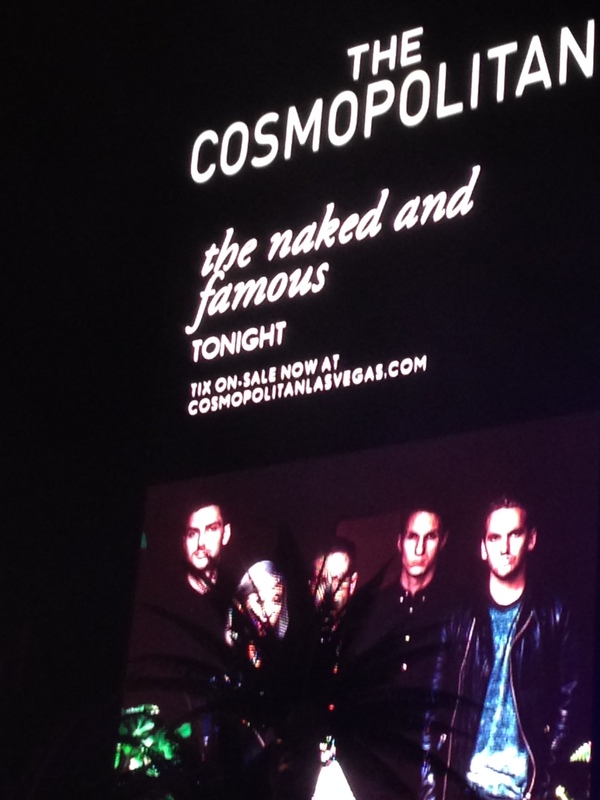 This entry was posted in Live shows and tagged Cosmopolitan of Las Vegas, Imagine dragons, Las Vegas, Naked & Famous, TNAF. Bookmark the permalink. I’m not hating on their second album. I’m really not. But I tried to listen to it more than once and just couldn’t. I just went back to Passive Me, Aggressive You. It seems like the band is trying to grow out of the young, fun sound to a more mature one. But it’s just not working, in my honest opinion.